Once again, blessed with brilliant weather, I had a great schedule arranged for this visit. Which saw me meeting Sir Mark Prescott, at Heath House, for the first time, an unforgettable experience, followed by an evening of fine racing at The Rowley Mile, for the Spring Meeting. And finally a chance to see the mares with foals at foot, at Shadwell Stud, Beech House, and Newmarket. The pace and visual stimulation was fast and I was on this occasion, more concerned with gathering photographic material, while observing from as many different viewpoints as possible, while we had such good light. The ‘behind the scenes’ access kindly arranged for me at both the racetrack, and the stud, was a great opportunity for me to do this. So for this blog, my visual posts are more photographic and research based. Paintings will be developed using this material, and memory, together with my thumbnail sketches and on the spot squiggles and notes at a later stage. 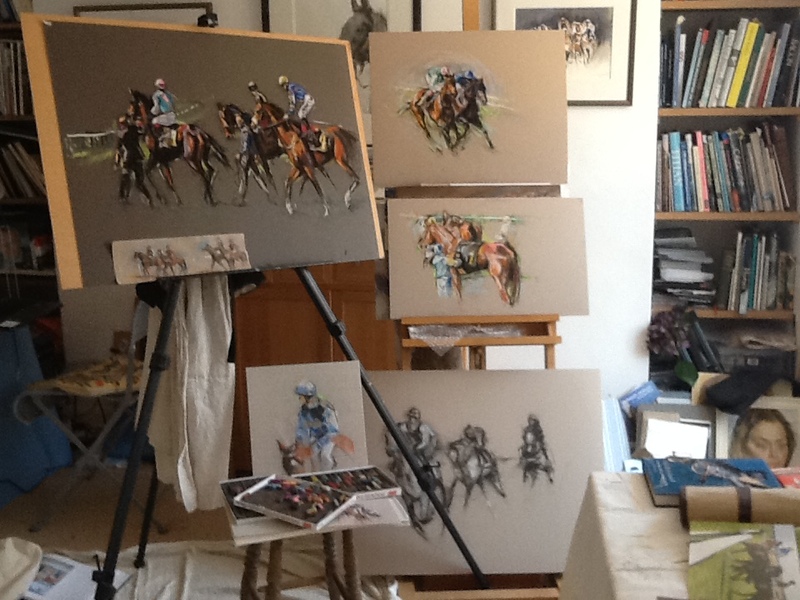 I do however, have a current colour pastel ‘racing works in progress’ photo taken in my studio, to post, that shows ideas that have been inspired by both The Craven meeting and the Spring Meeting at The Rowley Mile. My visual response, which as you can see, is mainly connected through COLOUR and SPECTACLE. In mid-May I was delighted to be visiting Sir Mark Prescott at his historic yard at Heath House. What had originally been planned as an hour’s introductory visit, in the end, turned into a most insightful and interesting morning of observation, conversation and education. Sir Mark invited me to accompany him on the morning inspection of horses initially in the indoor school, and afterwards out on their morning exercise. Heath House Stables is redolent with history and character and kept in absolutely pristine condition, combining the charm and history of a historic stable yard, with impressively modern facilities. I was particularly struck by the calm and courteous atmosphere at the yard. Sir Mark was a most kind and generous host. He possesses a keen eye for and knowledge of art himself, which made for interesting conversation about equine artists of the past, together with what I might have in mind for my own paintings at Newmarket for the Residency. It was, fortunately, a sunny, clear morning to observe his first and second string of horses out on Warren Hill, and with Sir Mark talking of the layout and history of the gallops, in relation to the town itself, which lies at the foot of the hill. I was able to visualise various compositions and ideas for paintings. 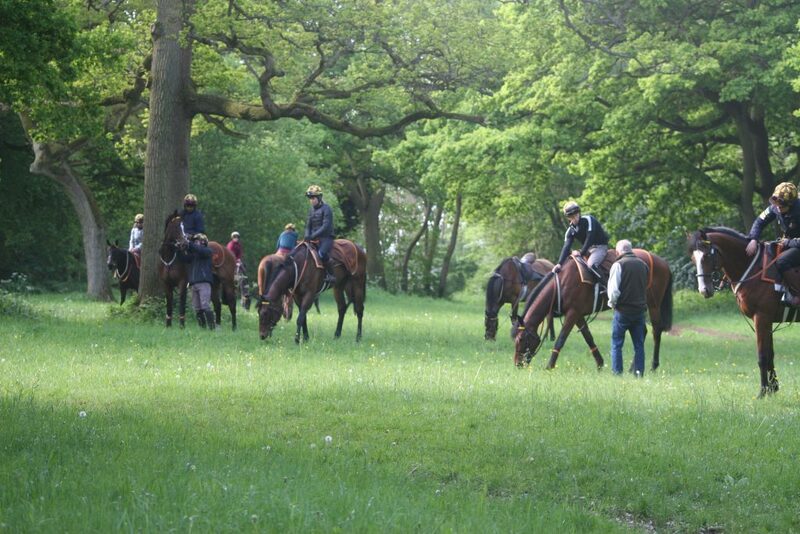 The highlight however, of this visit for me, was a completely unexpected sight…….when we went up into the fine old woods at the top of the hill to see Sir Mark’s horses and riders cooling down, relaxing in informal groups, the horses with their heads down grazing, after their work. Sir Mark strolled amongst them chatting with the riders. We observed them filing past along the woodland path back to the wide open space of Warren Hill, a wonderful sight; the dappled sunlight playing on their polished coats, and the deep green glades and ancient trees, with chestnut blossom, providing a magical backdrop. Such an inspirational sight, and one which I am sure will come through in my paintings. Earlier that morning, in the yard, I had talked of how at this stage of the residency I like to keep an open mind as to the exact subject matter for my paintings. With nothing too pinned down. More observing and absorbing impressions from a general viewpoint and leaving enough space and time for subjects to present themselves, within a broader context. This is precisely what happened at the woodland. A completely unexpected and delightful tableau, of timeless tranquillity. A stunning evening on which to return to The Rowley Mile, and this time, thanks to the kindness and efficiency of the Course Officials and Chloe Freds, I had special access arranged for some different photography locations. I am particularly attracted to the spectacle of the horses and jockeys, going on to and coming off the course. It is an iconic subject much favoured by racing artists historically, especially Degas and Munnings. On this evening, I was also granted access to observe the horses from inside the paddock, and at the starting stalls, which was a huge bonus, and the entire evening was an exhilarating race for me, from paddock, to track, to the starting stalls, with barely time to pause between each race. What an experience. Along with the interesting compositions, I was drawn to the brilliant colours and the long shadows cast by the horses in the low evening sun. From inside the paddock, I was also fascinated by the compositions of various groups of people watching the parade, and also the jockeys entering the arena, to meet the trainer and mount their horse for the race. After being introduced to Richard Lancaster, Stud Director at Shadwell Stud, by Grant Harris, CEO at The British Racing School, back at The Craven Meeting in April, I was looking forward to visiting the famous Shadwell Stud. This Stud has long had a connection with equine artists and unusually, features racing paintings in their yearbook. My visit was kindly arranged by James O’Donnell. 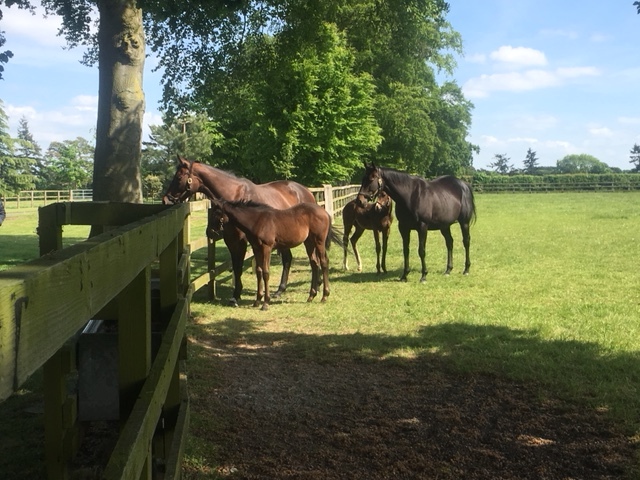 He suggested, that the best place to see the mares with foals at foot, this month, would be at the Beech House Stud, in Newmarket, before the foals go to Ireland to be weaned. 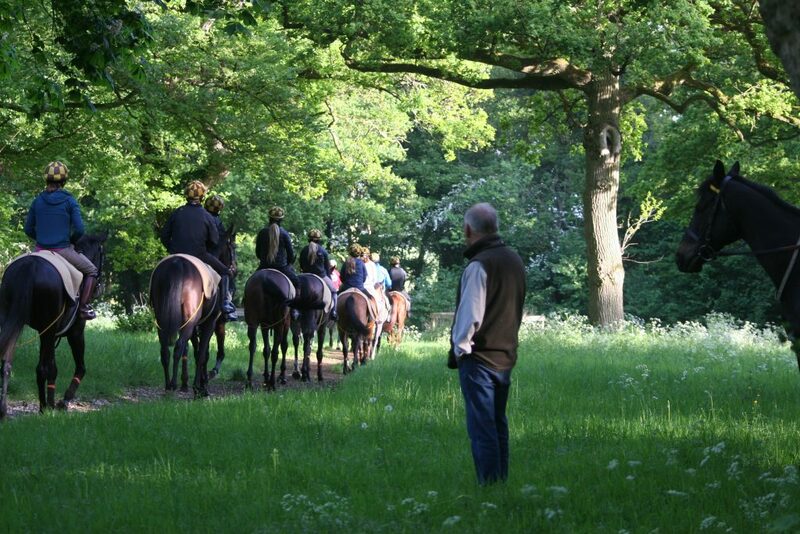 Timing was therefore key, and so I was thrilled to be able to spend an afternoon , there accompanied by Shadwell Stud nominations assistant, Naomi Leak, observing the mares and foals in their stunning, quintessentially Suffolk landscape surroundings. Bringing to my mind the Stubbs masterpieces of this very subject. 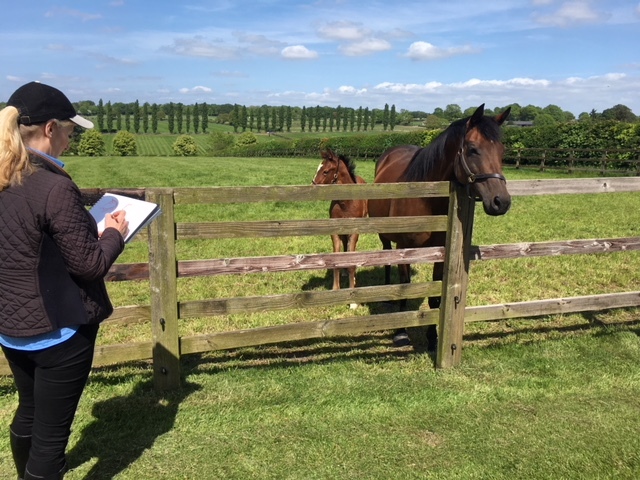 A blissful afternoon of sketching followed, studying the dynamic both between the mares and foals and the various groups within each paddock. Foals are an endlessly fascinating and indeed challenging subject for sketching! Their impossibly long legs and compact bodies adopting extraordinary shapes and patterns against their mothers’ flanks. It was a hot afternoon and the ambience in the fields was drowsy and relaxed. The mares and foals were incredibly friendly with the young already clearly used to being handled. They were most engaging and curious as to what I was doing with the pencil and sketchbook and enjoyed any chance to receive a stroke, from across the fence. It was such a privilege to visit the stud and observe these beautifully bred mares and foals of the very highest quality, and at this stage of their development, and lives. What a joy. And offering so much scope for interesting drawings and paintings.